British Columbia, or BC as it is more commonly referred to, is located on the west coast of Canada and is enjoying an expanding tourism industry. While the largest city is Vancouver, the province’s capital is Victoria and both cities have their fair share of attractions, top class hotels and affordable British Columbia accommodation. This part of Canada is known for its green landscapes and booking a rental car in British Columbia along with your hotel will make it that much easier for you to see as many of its scenic landscapes as possible. Whether you are looking for a fancy 5 star hotel in British Columbia or a more affordable option like a cheap hostel to fit your budget, one thing is for sure – you won’t be spending too much time in your room with so much to see and do! The Seawall in Vancouver is one of the most popular sights. You can hike or bike up here and, if you choose to do so on a more overcast day, you will avoid the usual crowds. On the way, you can stop off at the aquarium and take your time really enjoying the views. Stanley Park is the third-largest in North America and attracts 8 million visitors per year! 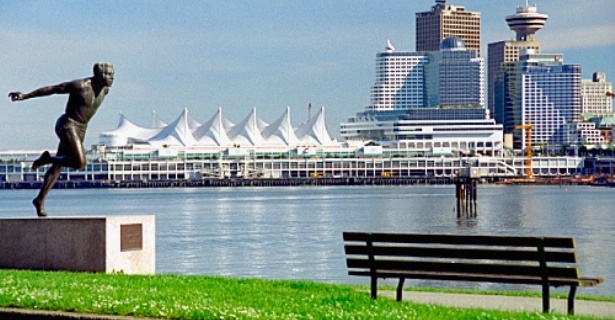 This fabulous Vancouver Park is filled with features and activities to keep everyone happy. North of Vancouver you will cross the Lions Gate Bridge which will lead you to Capilano Canyon. Enjoy a scenic skyride and take in the views. Afterwards, you can continue to the Tsawwassen Ferry Terminal which will allow you passage to Victoria. Hereafter, make your way to Nanaimo where you can visit the Newcastle Island Provincial Marine Park and the Bastion which is a wooden gun tower built in 1853. Howe Sound is another lovely place to visit. Experience the magnificent narrow channel that has been carved by glaciers and visit the BC Museum of Mining. What is now a museum was once a thriving copper mine that employed 60,000 workers. The Shannon Falls Provincial Park is perfect for hiking and spending some time enjoying the tranquillity of the flowing water. If you visit BC in the winter months, you can enjoy some great skiing at the nearby Whistler Ski Resort. Other activities include hiking, golfing and river-running. If you are looking for the perfect spot to relax and soothe any tired muscles, be sure to visit Harrison Hot Springs and enjoy the indoor and outdoor facilities. The best way to really get the most out of any trip to BC is by renting a car or even a motorhome and driving yourself around to all your favourite sites. If you plan your trip and itinerary in advance, you can allow for travel time and book a hotel room at each stop. No guesswork or struggling to find a place to stay since all your hotel accommodation in BC will be reserved in advance. For fantastic shopping, visit places like the Granville Public Market in Vancouver and similar markets in other cities. Merchants come from all over to sell their goods here. The Penticton Farmer’s Market is excellent for picking up some fresh produce for any meal. If you are planning a picnic or passing through the area and would like something fresh and delicious, this is the ideal place to stop and do some shopping. There are also various speciality shops scattered throughout the province with products that range from fashion to food and everything in between. There are literally hundreds of tour companies and guides that operate all over BC. Tours usually focus on a specific attraction so be sure to sign up for those you are most interested in. Some tours include whale watching, some are done by bicycle and others by kayak so you really can find something for everyone here.